Approximately 150 citizens from Hilton Head Island engaged in the Hilton Head Island – Our Future Think Tank on June 23, 2017. The Think Tank workshop examined plausible futures for Hilton Head Island, looking out as far as 2040. Prior to the Think Tank, surveys were conducted online with the invited workshop participants in order to ascertain the pre-existing views of the participants prior to the workshop. The survey conveyed a strong appetite for a shared future vision for the Island. Tourism is very important to Hilton Head Island. However, when asked about the optimal level of visitation by 2040 (currently it is 2,600,000 tourists annually) there was consensus regarding maintaining the same level of tourism in 2040. Similarly, the participants were asked for their thoughts on the level of permanent population that would be optimal in 2040. There was no aspiration generally for a notable increase in population by 2040. These findings indicated that there was a consensus around maintaining the present circumstances within Hilton Head to a degree. Deepen the understanding and examination of how external events and local conditions could shape decision-making. Identify and understand the key influences, trends, and dynamics that will shape Hilton Head Island over the next 10 to 20 years, looking out as far as 2040. Create and describe four plausible long-term scenarios for the Hilton Head Island community. Begin exploring alignment around a shared future vision. Examine the strengths and weaknesses of the community as perceived by the citizens. The process involved an exploration and discussion of global, regional, and local trends and forces of change; development of a scenario matrix defining four plausible scenarios spaces for the future; and, the development of descriptive narratives of each scenario. The event concluded with a discussion of the scenarios, selection of a preferred scenario and plausibility mapping, and an exploration into the strengths and weaknesses of the community via the Attributes of Successful Communities exercise. Two axis were determined, as a result of research, analysis of the pre-Think Tank survey and Community Survey and interviews. As a result, the vertical axis was named ‘Development Trajectory’ with the ‘Protection of Traditional Strengths’ and ‘Revitalization and Modernization’ at each ends of this vertical axis. The horizontal axis was named ‘Cultural Character and Social Fabric’ with ‘Destination Community’ and ‘Inclusive Multi-Dimensional Community’ at each ends of the horizontal axis. A more in-depth description was included at the end of each axis. The participants were allocated to groups where they discussed one of the four scenario spaces. For example: The Scenario A space was defined as having a Cultural Character and Social Fabric which was focused on a Destination Community, and a Development Trajectory focused on Revitalization and Modernization. Each of the four groups were tasked with producing a name for the Scenario and describing the Scenario under the following categories. Finally, the groups were tasked with producing headline news for Community and Societal, Environmental and Landscape and Economic and Business for the years 2020, 2030 and 2040. This would enable the groups to really think about the reality of that scenario and how the scenario would be described over time. The groups then fed back to all of the workshop participants, in order for all participants to become familiar with the four scenarios. The scenario quadrant was produced with the names for each of the four scenarios, depicted below. 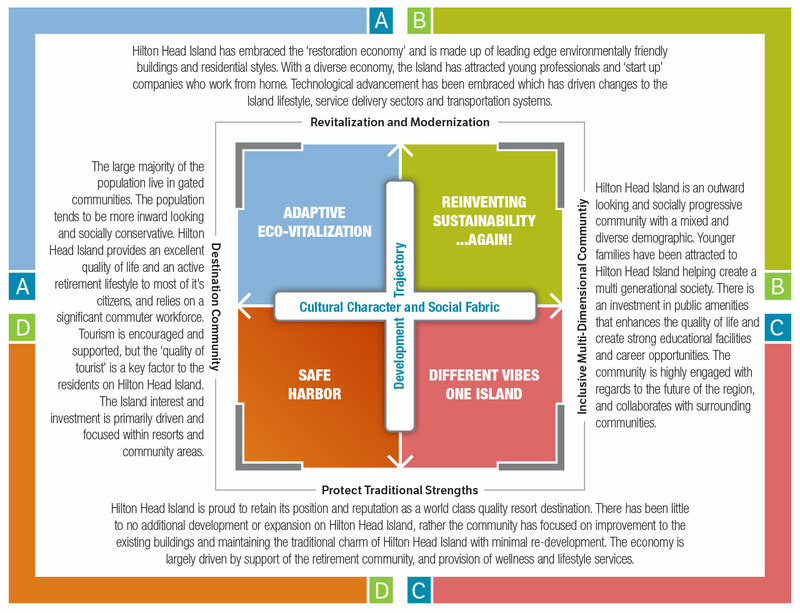 The information pertaining to each Scenario is outlined in the official Hilton Head Island – Our Future Scenario-Based Think Tank Report available at http://lab.future-iq.com/hhiourfuture. The process produced four very different plausible futures for Hilton Head Island. The participants were asked to complete a handout which indicated how plausible they felt that each scenario was. This information will be showcased via heat maps and a data visualization platform which will be able to be filtered and analysed by citizens across Hilton Head Island. This information will be showcased during the Engagement Sessions running throughout August and September across the Island, as the next phase of the Hilton Head Island –Our Future project.